Did conman Allen Stanford help in West Indies revival? It is four years to the day that the Stanford Superstars crushed England in the Stanford Super Series in Antigua - a match worth $20m (£12.5m) to the winners. The series, part of a then five-year contract between Allen Stanford and the England and Wales Cricket Board, caused considerable controversy, not just because of the extraordinary amount of money on offer but also because of the flamboyant Texan's behaviour. The series was denounced as a gimmick after the one-time billionaire arrived at Lord's by private helicopter, landing on the nursery ground, and then brought $20m in cash on to the stage to launch the tournament. Whatever happened to the Stanford Superstars? Stanford, who built his own cricket ground in Antigua, had to apologise to the England players after television pictures showed Matt Prior's then pregnant wife sitting on his knee during a game. But things changed quickly. In early 2009, Stanford became the subject of several fraud investigations and, on 17 February, 2009 was charged with investment fraud worth $8bn. He is now serving a 110-year prison sentence for his role in one of the biggest Ponzi schemes in United States history. Despite his spectacular downfall - and the problems he caused for thousands of investors - there are those who believe he has he left a positive impact on cricket in the Caribbean. Stanford's involvement in West Indies cricket started in 2006, when he created and funded the first Stanford 20/20 tournament. The second tournament took place in early 2008 and was watched by a reported global audience of 300 million. 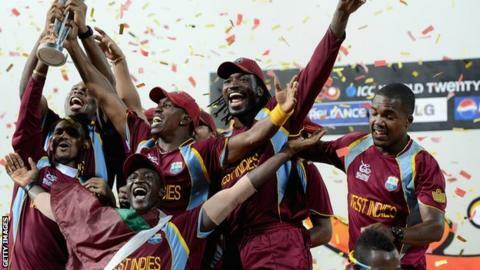 Less than a month ago West Indies became World Twenty20 champions, their first piece of silverware since the Champions Trophy in 2004 and before that the World Cup of 1979. West Indies captain Darren Sammy, man of the match in the final game of the Super Series in 2008, has little doubt that Stanford has left a legacy in Caribbean cricket. Speaking to BBC Radio 5 live for a special programme broadcast on Thursday evening, Sammy says Stanford played a huge role in regenerating cricket on the islands. "It was unfortunate what happened afterwards, but the impact he had on West Indies cricket can never be forgotten," said Sammy. "His tournament in the Caribbean did wonders, and guys like [West Indies internationals] Kieron Pollard and Andre Fletcher came through it. "At the time you could see all the young kids on the streets wanting to play cricket again. There was a whole new energy in our cricket." While England's preparation for the Stanford Super Series was widely questioned, Sammy says the Stanford Superstars were especially focused ahead of the match. He added: "We prepared well. We were in camp in Antigua for around a month and a half, training every day. Once that game came on 1 November, we were ready as a team, and it showed in the way we played. "Our players had never been exposed to such incentive, and that was a massive motivation. "It was a life-changing moment for the 11 guys that played, and the rest of the squad and the management staff were rewarded as well." The players all received their money, although there have been suggestions some were encouraged to reinvest with Stanford's companies. "That I don't know, I have never asked," Sammy said. "I got paid and I did what I had to do and invested the money. I guess everybody did what they thought was good for them at the time." Ian Bell, Matt Prior (wk), Owais Shah, Kevin Pietersen (capt), Andrew Flintoff, Paul Collingwood, Samit Patel, Luke Wright, Graeme Swann, Stuart Broad, Steve Harmison. While admitting that Stanford's absence has left a financial void in West Indies cricket, Sammy insists the future of the game in the Caribbean is healthy. "We need to keep on winning and then you'll see the fans back supporting us," he said. "We have never been short of talent in the Caribbean; it's about nurturing it and developing it. "We still have a lot to offer in all three formats. Hopefully we can continue to produce good cricketers that will influence and have an impact on the lives of the Caribbean people." As for Stanford himself, Sammy says he feels no animosity. "Obviously no-one would wish bad things on people," he said. "In life you all have choices. It's just sad how it all ended. I didn't foresee what happened and I don't know the details. "But I do know we as a team will never forget what he did for the Caribbean in terms of bringing back the interest in cricket." Listen to the full interview with Darren Sammy on 5 live Sport from 19:30 GMT. Guests include West Indies legend Sir Viv Richards, former England bowler Steve Harmison and commentator Tony Cozier.